Preheat oven to 350 degrees. Place paper liners in two standard sized muffin pans. Whisk flour, baking powder, and salt in a large bowl. In a separate large bowl, beat butter with 2 cups of the sugar until light and fluffy, about 4 minutes. Add in the vanilla and beat once more. Add flour mixture to the butter mixture in three parts, alternating with the milk and beginning and ending with the flour. Mix until just combined. Clean the beaters of your electric mixer and then, in another large bowl, beat the egg whites on low until they become foamy. While still beating on low, slowly add the remaining 1/4 cup sugar and then increase the speed to high and beat until stiff peaks form, roughly 4 minutes. Do not overbeat. Fold one third of the egg-whites into the butter-flour mixture until combined. Fold in remaining egg-whites, being careful not to mix too vigorously and deflating the air bubbles you created in the egg whites. Gently stir in the shredded coconut. Evenly scoop 1/4 cup of the batter into the muffin cups. Bake, rotating pans halfway through the baking time, until the cupcakes are golden and a toothpick inserted in the center of one cupcake comes out clean, approximately 20 to 25 minutes. Remove the cupcakes from the tin and let them cool completely on a wire rack. Frost cupcakes with your favorite vanilla buttercream and garnish with toasted coconut if you'd like. The most tender cupcakes, full of coconut flavor! 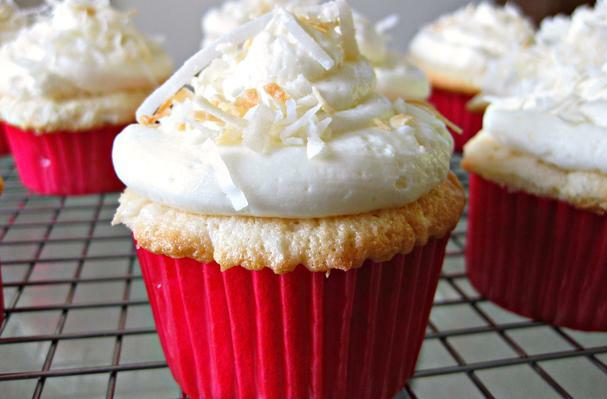 Frost them with your favorite vanilla buttercream and sprinkle the tops with toasted coconut. They may be stored in a covered container in the refrigerator for up to 3 days.